In Edna, Texas, near Redeemer Lutheran Church. We returned the WELS (Wisconsin Evangelical Lutheran Synod) Christian Aid & Relief trailer to Austin Sunday afternoon. It was several long days, lots of miles, heat, and mosquitoes. (So. Many. Mosquitoes.) We can’t help but feel we didn’t even make a dent, but for the fifty or so families we helped, we’re sure we made a huge difference. 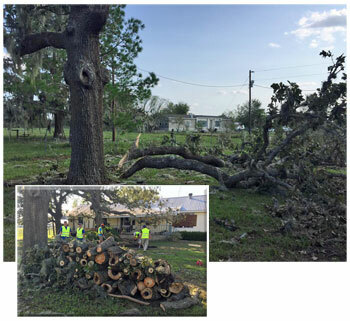 We chopped up fallen trees, put tarps on damaged roofs, moved a carport that had relocated seventy feet down a driveway, delivered water and food, and still found time to help move furniture into the new office building that is serving as the Victoria mission. 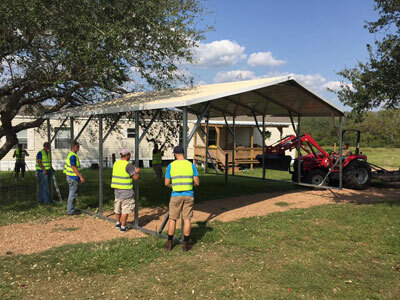 Members of Pastor Glaeske’s team move the carport back to its original location (Victoria, Texas). It was heartwarming to see so much selfless giving in four days – selfless giving that reflected how our Savior Jesus gave himself selflessly and entirely for us, in order to save us from eternal, not temporary, destruction. There were also people from the local community who helped us out with their cool “toys,” which made the work much easier. God is good. 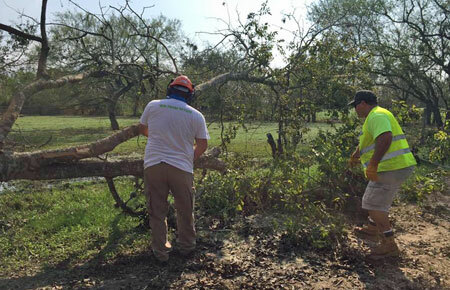 Risen Savior member Lars Noldan and Redeemer Victoria Pastor Glaeske cut down a tree that had fallen into a fence at a community member’s home in Victoria, Texas. The next time the news tells you we all hate one another, take a day and volunteer and give aid where it is needed. If you feel that all you can do is pick up a rake, even that is something. If you can operate a chainsaw, there is a need for that, too. If you can hold someone’s hand, listen to their story, and let them know that someday, the world will be right again and their yard won’t be quite so messy, that is something, too. If you can climb a ladder and lay a tarp on a roof so it looks like it was meant to be there, that’s amazing, and you are needed. If you can donate $2 to buy a can of bug spray, that is a huge blessing. God hears and answers every prayer of the righteous. Pray without ceasing. Members of Pastor Glaeske’s team cut up several fallen trees on several properties, stacked the logs and cleared the brush into burn piles. 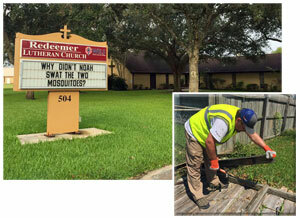 We feel so blessed that we were able to spend a few days helping Redeemer Lutheran Church clean up the homes of the people in their community. We were overwhelmed by how appreciative they were. We were simply there to offer what help we could and to give back some of the love God gives us. It was truly a labor of love in so many ways. We traveled to Edna as part of a coordinated effort through WELS Christian Aid and Relief, organized by Holy Word Lutheran Church in Austin. If you would like to volunteer for future relief efforts or donate to the relief fund, please check out the Hurricane Harvey updates here: https://wels.net/hurricane-harvey-updates/. And A note of encouragement.